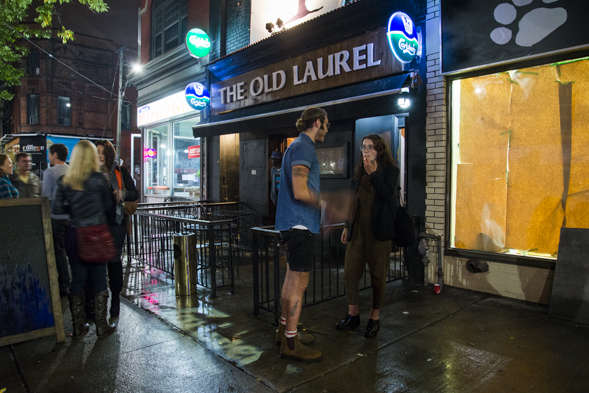 The Old Laurel has taken over the two storey College Street address that was formerly Rancho Relaxo . It's a new collaboration from Donnie Blais (who continues to run the Rancho Relaxo food truck ) and Davy Love (formerly of The Bristol , and The Bristol Yard before that). Love cites his distaste for West Queen West's new condo-centric lifestyle as his main motivation for moving on. The chef/owner felt constrained creatively at his former spot, and views this new endeavour as a homecoming of sorts as he returns to a neighbourhood where he once ran a Kensington Market pub and hosted mod Brit-pop dance parties like Blow Up. On the main floor, the pub room is outfitted with dart boards, a jukebox and a fireplace. Here, the bar pours pints of Tetley's, Cornish Orchards Cider, and Fullers ESB (to name a few) and offers imported sodas like Irn Bru ($3) and Tizer ($3). 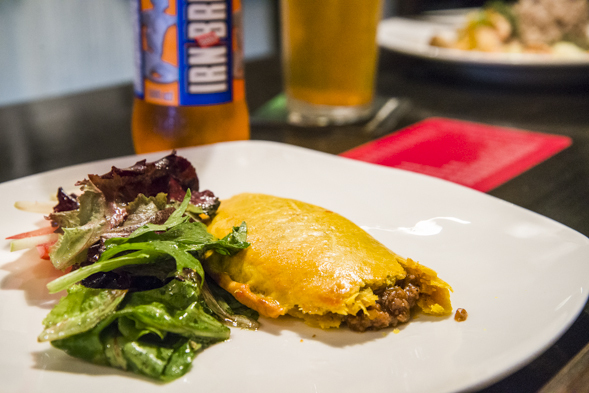 The menu offers a range of proper English pub foods plus a few new forays into the cuisines of other Commonwealth countries like India and Jamaica. Familiar favourites like fish and chips with mushy peas ($15), duck scotch eggs ($8), curries ($15), and Sunday roasts ($20) are all present. There's also big English breakfasts ($15 including drip coffee) served on weekends for brunch. 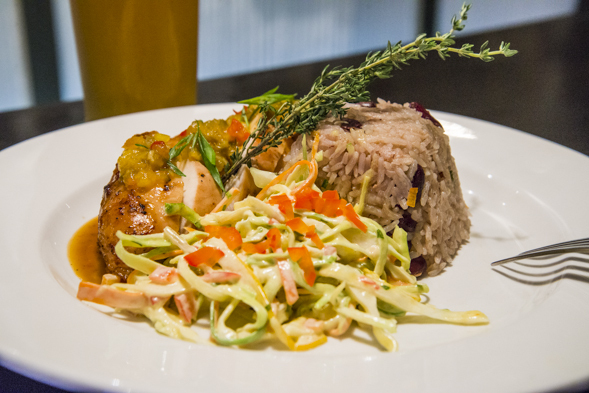 The common thread is foods that are hearty and comforting, and even plates of jerk chicken ($15) accomplish this goal. Dressed with a spicy mango, pineapple marmalade and served alongside creamy coleslaw with rice and beans, it is indeed a satisfying dish. They're making Jamaican beef patties ($7) from scratch too. Half moons of sweet golden pastry stuffed with a runny, spicy ground beef filling. 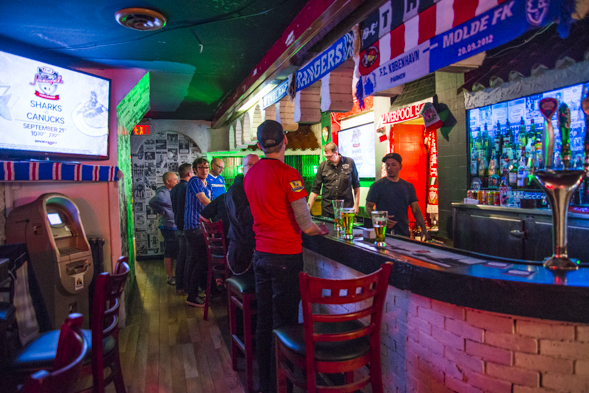 Upstairs, the Red Card Room is open for Premier League football matches and will host DJ parties and live concerts booked by Dan Burke from the Silver Dollar. During matches like the Manchester vs. Liverpool game I walked into, you'll find fevered football fans sporting scarves while they chant and cheer. 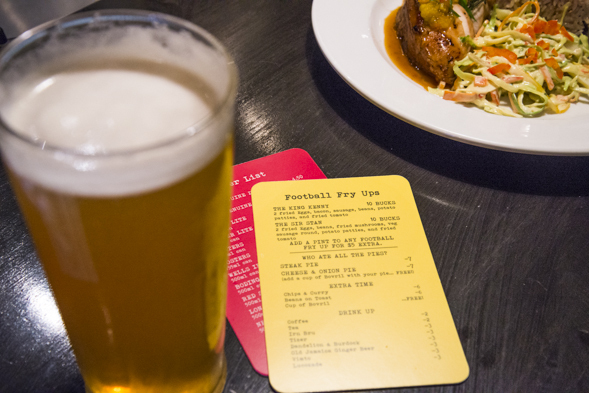 Pints populate every table, and there's an abbreviated list of Football Fry-Ups ($10) and snack foods like steak pies ($7), chips and curry ($6), and beans on toast ($6) on offer. The conversion from Mexican cantina to pub house is not exactly a seamless transformation - the stuccoed walls, archways, and faux clay tiles are hardly masked by soccer-centric adornments. Still this place has got soul - it's not fancy, but perhaps that's the point. 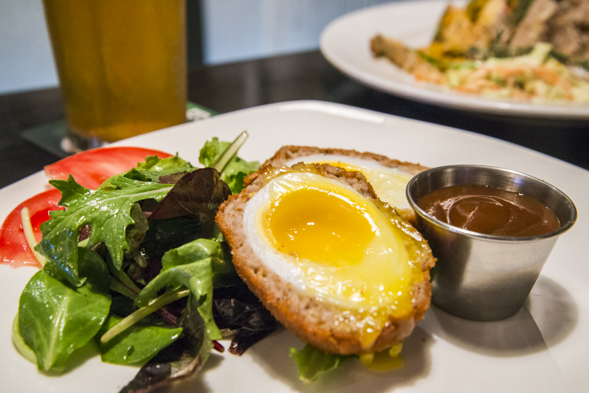 Let the condo-dwellers dine in the slick pub on West Queen West (which is still open by the way). 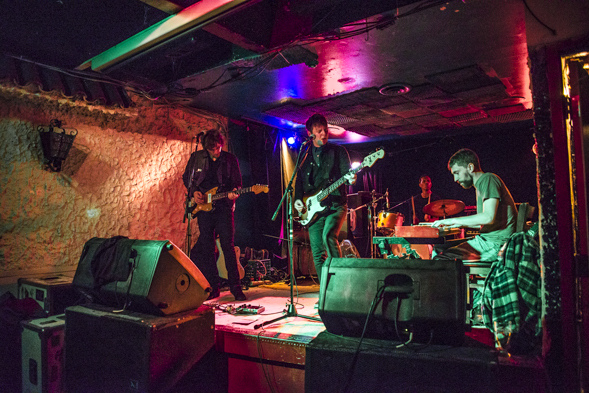 This new place welcomes locals, expats, music lovers, and diehard soccer fans.